Colorado has an unparalleled record for dinosaur discoveries. Fossils of most of the best-known of the giant reptiles were found first in Colorado, and the prospecting continues today. The dinosaurs who trace their roots to Colorado include such well-known species as the gigantic, plant-eating Apatosaurus and Supersaurus, the medium-sized, plant-eating Stegosaurus and Triceratops with their distinctive defensive features, and the large, meat-eating predators Allosaurus and Ceratosaurus. The discovery of dinosaur fossils near Denver and Cañon City in the late 1800s led to a Dinosaur Rush that paralleled the state’s Gold Rush, with paleontologists battling for the latest finds, chiefly in quarries but even along the streets of Denver and Lakewood. Unfortunately, these early excavations for dinosaur bones often were hurried and conducted crudely with bulldozers and dynamite. 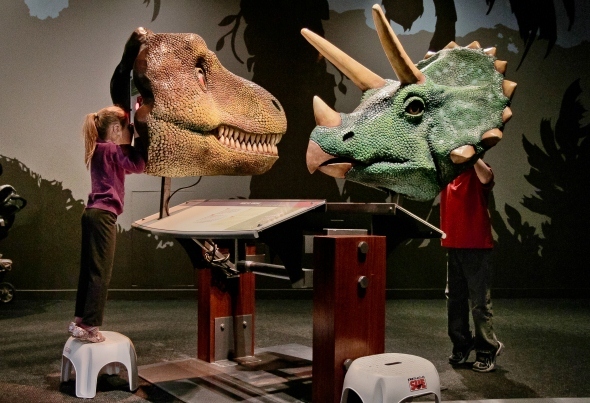 Dinosaur digs and quarries dot the state from the Colorado Plateau to the Eastern Plains, and skeletons recovered from Colorado are on display at leading museums in the United States and around the world. Colorado has even named the Stegosaurus as the official State Fossil to celebrate its achievements. The chief home for dinosaur skeletons is the Morrison Formation, a layer of sandstone and mudstone left by ancient waterways that is greenish and reddish in color. It was named for the Colorado town of Morrison after stunning discoveries were made nearby, in a place now known as Dinosaur Ridge. The groundbreaking work there by local residents in 1877 brought two of the world’s leading paleontologists to Colorado and kicked off what became known as the “Bone Wars” as the scientists vied to be the first to find, excavate, describe and name new species. By the time the dust settled in 1892, rivals Othniel Marsh and Edward Cope had documented more than 130 new species of dinosaurs in Colorado and other states, had located the first complete skeletons of the giant reptiles and had boosted the field of paleontology in both academic research and public visibility. The state’s dinosaur finds are legendary, particularly those from the Dinosaur Ridge west of Denver, Garden Park near Cañon City, the Dry Mesa Quarry near Delta, Riggs Hill and Dinosaur Hill near Grand Junction and the Dinosaur National Monument in the state’s northwest corner. Today, some of the state’s top dinosaur digs are open to the public. Others, however, were exploited and then abandoned by dinosaur hunters, leaving behind just simple plaques and signs today. Dinosaur remains are plentiful because Colorado was home to the reptiles throughout the Mesozoic era. The first dinosaurs recorded in the state were from the Triassic period, when much of Colorado was above sea level and the sea left sediments where the skeletons were found later. Among the dinosaurs from this period about 250 million years ago are the Aetosaurus and Phytosaurus. The heyday for dinosaurs, however, came in the late Jurassic period 150 million years ago, when streams, lakes and rivers deposited layers of sandstone and mudstone along the floodplains and coastal lowlands that became the famed Morrison Formation. The dinosaurs from this era include the Apatosaurus, Supersaurus, Stegosaurus, Allosaurus and Ceratosaurus. During the Cretaceous period about 100 million years ago, a shallow sea expanded across Colorado, and dinosaurs left footprints in the forested and swampy areas along the sea’s edge that became the Dakota Formation. Just before the end of the Cretaceous era, the Rocky Mountains began to rise, and such dinosaurs as the Triceratops and Tyrannosaurus arrived to eat broadleaf trees and palms. Recent research shows that a Dinosaur Freeway ran from south of Boulder into New Mexico along what was a coastal plain during the Cretaceous era. More than 1,000 dinosaur tracks have been discovered in the Dakota Formation, and there is evidence that the plant-eating dinosaurs traveled in packs, possibly to avoid the dinosaur predators of the time. The tracks resemble those of Iguanodons and Ankylosaurs. Dinosaurs began to disappear at the end of the Cretaceous period, but scientists believe that the mass extinction that occurred 65 million years ago was the result of an asteroid four to nine miles in diameter hitting the Earth. The collision sent dust and debris into the atmosphere and caused enormous fires, tsunamis and perhaps even volcanic eruptions. The heat from blast wave would have killed life in its path, and the dust and debris would have blocked sunlight vital to plants eaten by many dinosaurs. The earliest record of a dinosaur discovery in Colorado is an 1867 letter to Marsh from Golden civic leader Edward Berthoud describing dinosaur fossils that had turned up at a well being dug in Golden. Another early discovery was a 3 1/2-inch fossilized tooth that was described in an 1874 letter to Marsh from Berthoud, who enclosed a sketch of the specimen. It took another 31 years before the Tyrannosaurus rex could be named and described, based on skeletons unearthed in Wyoming and Montana, and it took another 128 years before a scientist identified the tooth as coming from a T. rex. At this point, the tooth is considered the earliest specimen found anywhere for a T. rex. The feud between Marsh and Cope had started around 1869 as they clashed over rights to bones from the nation’s earliest dinosaur find in New Jersey. Marsh also claimed in 1890 to have revealed to Cope’s embarrassment that Cope had placed the head of an Elasmosaurus on the wrong end of a skeleton. Lakes contacted Marsh in 1877 about the Apatosaurus find and sent him 1,500 pounds of bones, but he also sent specimens to Cope. Marsh published the first research about the discovery and paid Lakes $100 for the bones. Lakes then asked Cope to forward his specimens to Marsh, which offended Cope. Cope then received bones of an even larger plant-eating dinosaur that had been found near Cañon City by Fremont County School Superintendent O.W. Lucas. Cope named it the Camarasaurus. Marsh also was able to name and describe the Stegosaurus in 1877 based on bones that Lakes had discovered in the same area near Morrison, today’s Dinosaur Ridge. The two paleontologists continued battling over dinosaur finds and published research, and the fight led to excesses that included bribery, theft and vandalism. Their discoveries, however, were legion. Bones recovered from Garden Park led Marsh to name the Allosaurus and Diplodocus in 1877 and 1878 and Cope to name the Epanterias, an early meat-eating predator, in 1878. Marsh followed up in 1884 with the Ceratosaurus, another meat eater, from bones found in Garden Park. Marsh also named the Triceratops in 1889 based on bones found in west Denver, after mistakenly attributing them to an ancient bison when they were first discovered in 1877. In 1889, Marsh also named the Ornithomimus based on bones found southeast of what is today’s Carmody Park in Lakewood. Both were from the Cretaceous period. The Bone Wars ended in 1892, when Cope and Marsh both ran short of funding for their research. Cope’s work had been supported by a family fortune from the shipping industry and the Academy of Natural Sciences in Philadelphia. Marsh had done his work for the Peabody Museum at Yale University, which was founded by his uncle, financier George Peabody, and for the U.S. Geological Survey. Dinosaur digs in Colorado, however, continued. In 1900, paleontologist Elmer S. Riggs of Chicago’s Field Museum of Natural History recovered a partial skeleton on a hill west of Grand Junction that he named the Brachiosaurus three years later. The gigantic plant eater was the largest dinosaur on record for decades. Riggs also unearthed bones from a Camarasaurus near the Colorado National Monument and two-thirds of an Apatosaurus skeleton from Dinosaur Hill near Fruita in 1901. The specimens were exhibited at the museum, drawing large crowds. Paleontologists J.B. Hatcher and W. Utterback from the Carnegie Museum of Natural History discovered the plant-eating Haplocanthosaurus in Garden Park in 1901, and Hatcher named it two years later. A larger version of the dinosaur was recovered from a nearby quarry between 1955 and 1957 by Yale University zoology student Edwin Delfs, working with a team of high school students. A major discovery came in 1972 as Delta rockhound Vivian Jones found bones from a Supersaurus in the Uncompahgre National Forest outside Delta. Jones contacted paleontologist James A. Jensen of Brigham Young University, who named the dinosaur and developed the Dry Mesa Quarry that has produced bones from more than 30 kinds of dinosaurs. The Supersaurus took over the title of the largest dinosaur. Jones and her husband, Daniel, also discovered a meat-eating Torvosaurus in the quarry in 1971. The dinosaur was named and described by Jensen and Peter M. Galton in 1979. Another new dinosaur was found in the 1970s at the Fruita Paleontological Area in by paleontologist George Callison for the Natural History Museum of Los Angeles County. The Fruitadens was named in 2009 after the nearby town. The small, beaked dinosaur was just 28 inches long and weighed just 1.7 pounds and is believed to have eaten plants, eggs and insects. Research also continued into older specimens from Colorado. In 2002, a review by Kenneth Carpenter of the Denver Museum of Nature & Science determined that the tooth found by Lakes near Golden in 1874 belonged to a Tyrannosaurus rex. Carpenter, working with museum volunteer Kathleen Brill, also reexamined a partial dinosaur skull that had been found in the Garden of the Gods park in 1878 by Colorado College professor James H. Kerr and has been sent to Marsh. They determined that the skull, which had been stored at the Peabody museum and once had been thought to belong to a different, previously known dinosaur, actually was from a new dinosaur, which they called the Theiophytalia, or “belonging to the gods,” after the Garden of the Gods Park in 2006. Dozens of skeletons from these dinosaurs and others have been discovered in Colorado over the years, earning the state international recognition from paleontologists. Dinosaur digs continue in parts of the state, though most of the quarries have been retired from active exploration. Dinosaurs also have long fascinated schoolchildren, and a class from Thornton’s McElwain Elementary School decided in 1982 that Colorado needed an official state fossil. The class won over Gov. Richard Lamm, who followed the students’ wishes in 1982 and declared the Stegosaurus to be the state fossil.